Elastic energy harvesting; perovskite nanolasers; seeing the whole battery. 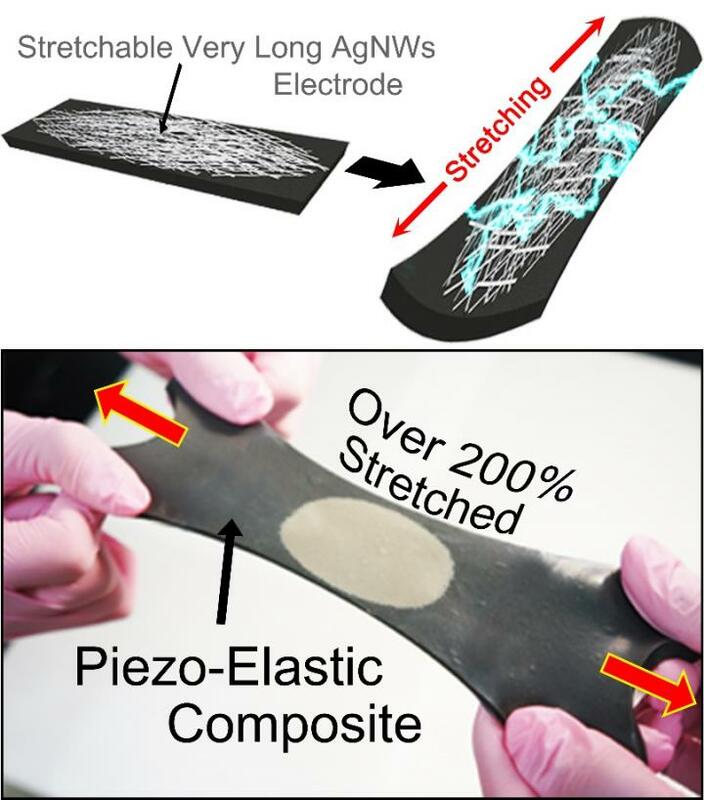 Researchers from the Korea Advanced Institute of Science and Technology (KAIST) and Seoul National University collaborated to develop a hyper-stretchable elastic-composite energy harvesting device. Their stretchable piezoelectric generator can harvest mechanical energy to produce a ~4V power output with around 250% elasticity and a durability over 104 cycles. These results were achieved thanks ­­to the non-destructive stress-relaxation ability of the very long silver nanowire-based stretchable electrodes as well as the good piezoelectricity of the device components. The new device could be applied to a wide-variety of wearable energy-harvesters to transduce biomechanical-stretching energy from the body (or machines) to electrical energy. Perovskites are a focus of attention for high-efficiency solar cells, but a team from the University of Wisconsin-Madison found another area in which they excel. “While most researchers make these perovskite compounds into thin films for the fabrication of solar cells, we have developed an extremely simple method to grow them into elongated crystals that make extremely promising lasers,” says Song Jin, professor of chemistry at UW-Madison. 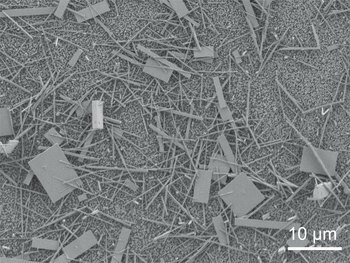 The tiny rectangular crystals grown in Jin’s lab are about 10 to 100 micrometers long by about 400 nanometers across. Nanowire lasers have the potential to enhance efficiency and miniaturize devices, and could be used in devices that merge optical and electronic technology for computing, communication and sensors. Plus, simply tweaking the recipe for growing the nanowires could create a series of lasers that emit a specific wavelength of light in many areas of the visible spectrum. Before these nanowire lasers can be used in practical applications, Jin says their chemical stability must be improved. Also important is finding a way to stimulate the laser with electricity rather than light, which was just demonstrated. Recharging lithium batteries is not without problems, some of them leading to the premature death of the battery. An eruption of lithium at the tip of a battery’s electrode, cracks in the electrode’s body, and a coat forming on the electrode’s surface are a few of them. Using a powerful microscope to watch multiple cycles of charging and discharging under real battery conditions, researchers at the Pacific Northwest National Laboratory have gained insight into the chemistry that clogs rechargeable lithium batteries. The problem in the past has been similar to Heisenberg’s uncertainty principle in that observations caused the environment to change. Unlike other views of the inner workings of batteries at high magnification, most of which use only part of a battery or have to study them under pressures not typically used in batteries, the team created a complete functioning battery cell within a transmission electron microscope operating under normal operating conditions. “This work is the first visual evidence of what leads to the formation of lithium dendrites, nanoparticles and fibers commonly found in rechargeable lithium batteries that build up over time and lead to battery failure,” said Nigel Browning, a physicist at PNNL. Solving these problems could also make electric vehicles and renewable energy more attractive. Using metals such as magnesium or aluminum in place of lithium could improve batteries life and cost, but research and development into non-lithium rechargeables lags far behind the common commercial lithium ion ones. Although these experiments taught them about lithium behavior, Browning said he’s more excited to apply the technology to study other metal anodes, metals such as magnesium, copper and others that might lead to a new generation of battery systems.